On November 22 and 23, 2017, The Territorial Planning Unit of Grand Council Treaty #3 hosted Gaanawendagoziwinaan [Planning for 7 Generations: A Conference on Climate and Water] at Seven Generations Education Institute in Kenora, ON. 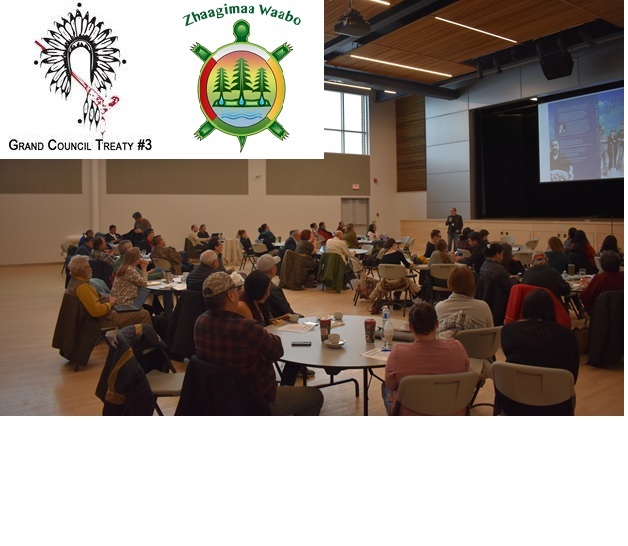 Gaanawendagoziwinaan was attended by many, (70 participants on day 1, over 90 on day 2) representing 20 Treaty #3 First Nations and locals from Kenora, Fort Frances and Dryden, as well participants from as far as BC and Quebec. A diverse group of organizations and individuals participated throughout the 2-day event to discuss and learn about current issues and challenges related to water and climate change in a rapidly changing environment. A strong emphasis was placed on the work being done to develop and create solutions that help First Nations adapt to our ever-changing environment while simultaneously creating strong, resilient communities with the guidance of Manito Aki Inakonigaawin (Anishinaabe Resource Law). Gaanawendagoziwinaan brought together First Nations members and local organizations from Treaty #3 and surrounding Treaty areas, as well as other interested members of government, academia, and non-governmental organizations. Gaanawendagoziwinaan created a forum for all to share and learn from these organizations and the Anishinaabe Nation of Treaty #3. For full story please email water@treaty3.ca.